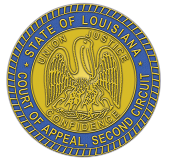 ©2012 State of Louisiana Court of Appeal, Second Circuit (Shreveport). All rights reserved. This website was created to comply with WAI-ARIA standards for equal access, and is compatible with all major web browsers.